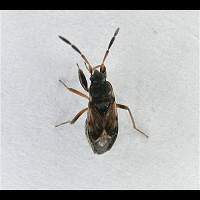 Of all Scolopostethus species Scolopostethus thomsoni is probably the most common. It measures 3.4 to 4 mm and the wings are almost always reduced. On the wings it has some scattered hairs. The antennae are bicoloured, but unlike the other species the darker part begins at the top of the 2nd segment. This usually is the best way to identify this species. Scolopostethus thomsoni appears where ever the Common Nettle is growing. It doesn't care what type of soil is present and neither does it pay attention to whether the conditions are dry or wet: whenever Nettle is there this species is there. It is present all over Europe, Siberia, Eastern Asia, Japan and Northern America. A very common species all over Britain and Ireland.